I mentioned that I wanted to do another version of this dress. And, having experimented with the discharge paste I couldn’t wait for the weekend! 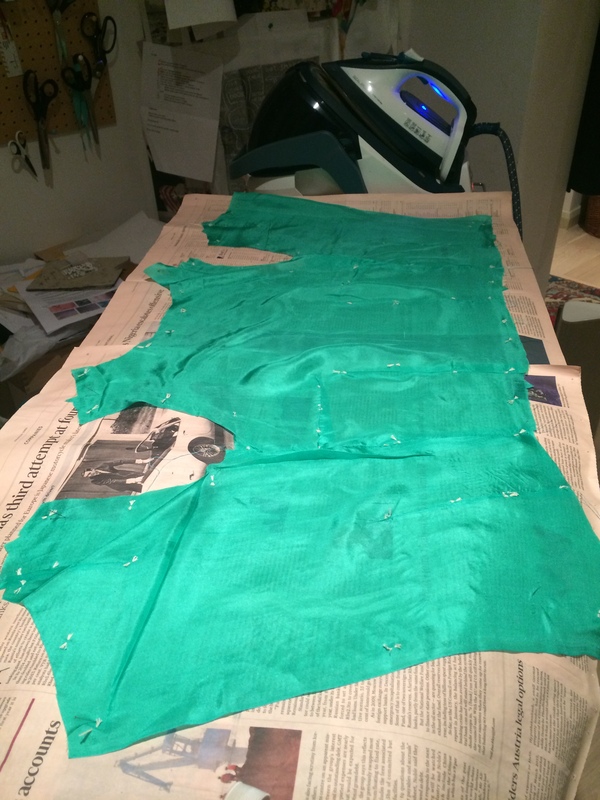 This time I have decided to make the skirt with green wool, and to use the discharge paste to create the camisole top. 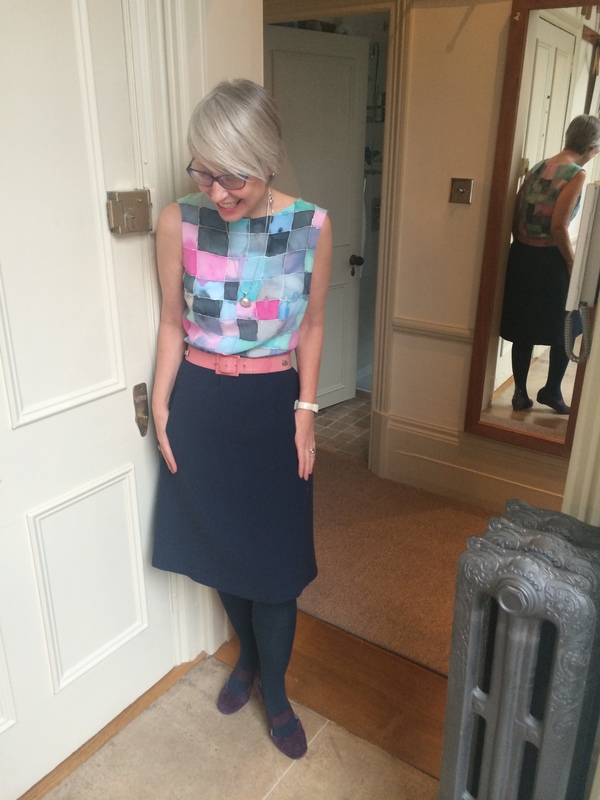 In the first (navy skirted) version I used white gutta and then painted each square with a different colour. 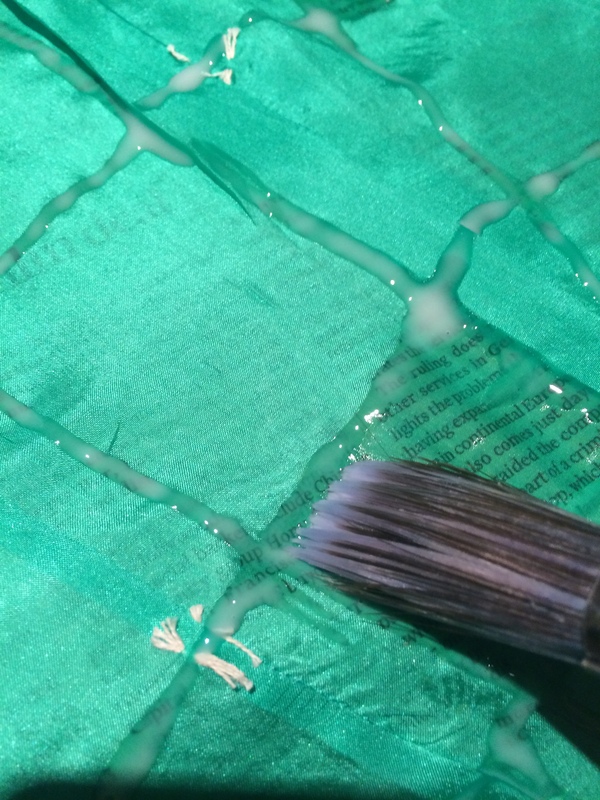 This time I use thed discharge paste to create a green and white version. First I made up the green silk bodice by putting in the darts and joining the side seams. I covered the ironing board with newspaper, and then pinned the bodice to it. This meant it was fairly stable while I used the discharge paste. I used a plastic ruler to guide my lines, making them approximately 2″ squares. The lines may have been a bit thick, but the material doesn’t bleed so it dried quite well. Then I “coloured in [out]” some of the squares with the paste using a thick paint brush. Finally I used a finer paintbrush I also created a few subtle lines in some of the squares. Then I went to work and left it to dry all day. 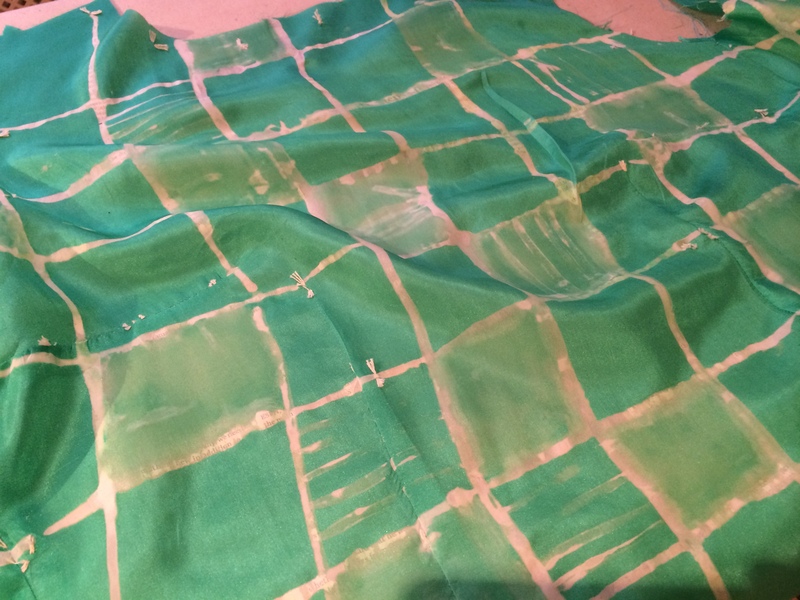 When I first ironed it the colour was rather yellowish, but I kept going and it became almost white. The newspaper stuck to the discharge paste, so once I had ironed it as much as I could to bleach it, I washed the fabric gently. This is necessary to remove the discharge paste, and the little bits of newspaper that stuck to the back. 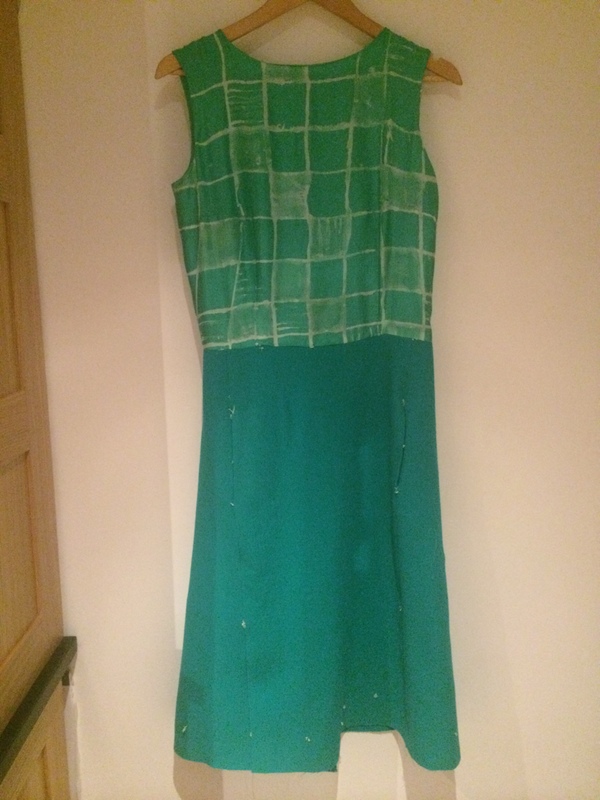 The camisole is lined in the same light weight green silk (plain), and the skirt is cut from the same Roland Mouret crepe double wool that I used for the previous overblouse. I cut out and attached the skirt. This is the unfinished dress before it has a zip inserted and not hemmed. I think the proportions look wrong. I am wondering about taking the top up just about one inch at the waist, and also making the skirt slightly shorter. This double crepe wool is heavy, and stretchy and although I used exactly the same pattern as before it seems that it will finish around two inches longer. I will leave it hanging for a few days to see how I feel about the overall shape of the dress. Any suggestions before I finish it? Gorgeous colours and effect. I like it short. I love the effect you achieved with the discharge paste (name does make me giggle!). Very impressed. For the length, shorter I think too. It’s such a pretty, spring-appropriate look, which calls for a fresh spring-like length. Just a little shorter I think. Its hard to tell on the hanger, but maybe it needs something to define the waist? Oooh, I like that green, bit of an envy monster myself! If you lifted the skirt by blousing the camp over it, would that work? I suppose if the top is a bit long it might do that anyway. Maybe we need a body shot once the zip is in? Still cackling over discharge paste – sounds so rhythm method to me! I think the ensemble looks very attractive. The effect with the different textures in different squares is clever!